The Farm is Open Today! Are you looking for something to do today that is fun, free and local? Well, look no further than the Big Wave Farm. Come anywhere between 1:00-4:00. The Farm is open today. You can meet and greet our new residents! If you have some food scraps including greens, you can bring that too. (no meat, fish, onions or processed please). They aren’t too picky, and are kid friendly. You can also look to see what is happening down on the farm. We are building a green house for our seed starts and tomatoes. Strawberries are being planted today too. Please stop by if you’re in the area. There will be a few snacks. If you have a snack or something to share, you can bring that, but not necessary. 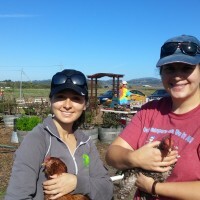 Next a Farm Day is Saturday a March 8, from 1:00-4:00. we will be painting the hen house, the colors of the rainbow!! !Save the date!